Standard Cochin Chickens are large and attractive birds that are good winter layers and have great mothering abilities. Size: Standard Male: 11 Ibs. / Standard Female: 8.5 Ibs. / Banatam Male: 32 oz. / Bantam Female: 28 oz. Comb, Wattles & Earlobes: All of these are bright red. Male: Has a medium sized single comb with five regularly spaced points that stand straight up, the middle of which is the longest. They have well rounded long wattles and earlobes. Female: The single comb is quite small and rounded as to conform to the curve of their head. They have well-rounded small wattles and oblong earlobes. Color: The beak is yellow shaded with black, unless otherwise noted. The eyes are reddish bay and the shanks and toes are yellow. Barred: They have standard barred plumage. They have a barred shank and outer toe feathers. Birchen: The head is white to silvery white. They have standard Birchen plumage. Black: The shanks and toe feathers are black as well as standard black plumage. Black Tailed Red: The beak is reddish horn and they have standard black tailed red plumage. The shank and outer toe feathers are a glistening red. Blue: They have standard blue plumage throughout, including the shanks and toe feathers. Brown: The beak is horn and the head is a dark orangey red. Male: The hackle and saddle are the same color as t the head or slightly more golden, but each feather has black to greenish black stripe tapering to a point at the end of the feather. The front, neck, breast, body, legs, shanks, outer toes, wings and tail are primarily black to greenish black but may be highlighted with golden bay. 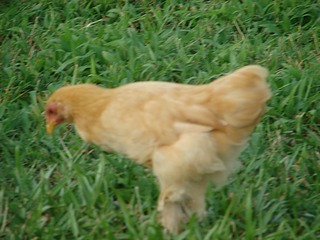 Female: The hackle is golden orange with a black stripe in the middle. The body is brown ranging from from light to dark and the feathers are stippled with black. The tail is also black. Brown Red: They have standard brown red plumage, including the shanks and toe feathers. Buff: They have standard buff plumage, including the shanks and toe feathers. Buff Columbian: They have standard buff Columbian plumage, except the toe feathers are buff with black. Columbian: They have standard Columbian plumage, except the shanks and outer toe feathers are white with black. Golden Laced: The beak is dark horn in color that shades to a yellow tip. Male: The head, neck, and saddle are golden bay with a black stripe down the middle. The cape is golden bay and the breast, body, wings, legs, shanks and outer toe feathers are golden bay with lacing of black. The tail is primarily black. Female: The head is golden bay and the hackle is black with golden bay lacing and shaft. The rest of the body is golden bay with black lacing and the main tail feathers are black. Lemon Blue: They have standard lemon blue plumage with the shanks and outer toes being grayish blue. Mottled: They have standard mottled plumage with half of the feathers on the shanks and outer toes being tipped with white. Partridge: The beak is dark horn in color with shading to yellow at the tip. They have standard partridge plumage. The shank and outer toe feathers in males are black and in females are a deep reddish bay penciled with black. Red: The beak is reddish horn in color and they have standard red plumage. Silver Laced: The beak is dark horn in color with shading to a yellow tip. They have standard silver laced plumage. Silver Penciled: They have standard silver penciled plumage. The shanks and outer toe feathers are black in male and penciled with gray in the female. White: They have standard white plumage including the shanks and outer toe feathers. Special Qualities: They are docile birds that are good winter layers and have good mothering abilities. Cochin Chickens were developed from the Chinese breed called the Shanghai. The Shangai had much tighter feathering than modern Cochin Chickens without the fully feathered legs. 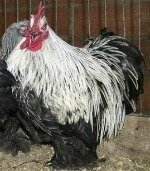 Breeders took the fluffiest of these birds and the ones with most feathering on their legs and bred them into the breed that we still see today. They were first introduced in North America in about 1845. Modern Cochin Chickens are still quite showy and are rather large birds who are made to look even larger from their thick, fluffy feathering. They are well known for their curved puffy tails that seems to stick up as they move around. They are slow to mature and therefore are not used in most broiler operations, although they are respectable meat birds to many backyard and barnyard operations. They are friendly and docile birds who like human companionship. They can adapt well to confinement or free range. Their feathering helps them be a hardy breed who can do well in cold climates. They were first accepted to the APA in 1874.